1: The weekend before, I’ll select a Tangle for the upcoming weeks adventure. 2: Monday & Tuesday, I’ll think about it, what I want to post, and decide on a string to use. I do not decide in advance what the tile will look like, as I prefer my tiles to be spontaneous. 3: Wednesday, on my lunch hour I’ll create a the piece for the adventure, I often do Zentangle® on my lunch, as it is so relaxing. 4: Wednesday Night, I’ll pre-type the blog post and have it ready so I can just publish it Thursday Morning. 5: Thursday, after getting back from Grocery shopping in the early AM, I’ll publish the Adventure for the week. Things were on track this week, until Tuesday night, when I was doing laundry. I went to the basement and lo and behold, the water was not draining. Well everything else screeched to a halt, I have had this problem before and it is not good. I tried the easy fix, ran to Home Depot and got industrial strength main line cleaner. Tuesday night I used all of it, adding an application every hour or so. By the end of the night the water was moving just a little. I hoped that it would be OK in the morning, it was not. If anything it was worse. I went to the YMCA, to shower, and went to work for a couple hours (I am the only one in the office from 8AM-9AM,) so I figured I should go in. I stayed a couple hours and then headed home to get to work. By lunch I thought I had I cleared, but after lunch it was slow again. After more snaking and the use of a Blow-bag, I got it. It should be good now. Then it was clean-up time. Got the basement scrubbed down with bleach, ran out and got dinner, did shopping (as I was going to work early Thursday.) Once all of that was done it was 9:00 PM, I broke out my Tangle kit and watching/listening to the TV show Vikings, I got my Tile done for this weeks Adventure. I have to say If I had not been so busy I would have done more than one, I really like this weeks Tangle. Now sometimes when choosing a Tangle, I’ll simply choose one that is one of my favorites. I often try to switch between, organic, and ridged tangles. 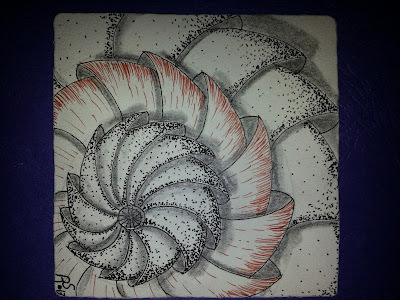 This week I decided to explore Zentangle a little bit more. I headed over to tangle patterns.com and looked around for one that fit two criteria, one: it looked fun, two: I had never done it before. The winner this week was Phiscops, I think it was love at 1st tangle. I am now a huge fan of this tangle, if you have not used it before, give it a try, it is lots of fun. I love what you did with it! I have been playing with this one myself lately, so I will try to get something finished for this challenge! Quick question, if we complete tangles after the week is over, can we still post up our results? Yes Please do, the only thing is, it will most likely not make it into the slide show. I think if a number of people did older challenges I would eventually do a catch-up slide show though. I am looking forward to what you create. That's OK about the slide show. I have seen others who do these challenges at their own pace and "catch up" when they are new to tangling, so I was curious. I also went Rick's Paradox crazy last week and wanted to post up my piece, but wasn't sure! Thanks. I understand about catching up, I am currently working my way through all of the Diva's challenges, I just finished #26. All done with this one. Exceptionally challenging and fun. Roy, Thanks That was a fun phicops challenge or it was for me. I love this tangle pattern. Thanks for this challenge. Wow, you really had a week of general living, hope that drain stays clear. You keep coming up with tangles I probably wouldn't try on my own, but you inspire me to give them a go and stretch my creativity. enjoyed your chalenge this week Rob, good luck with that drain issue, i've had a couple myself in the past so can feel your pain! Thanks for another fun challenge. It is very interesting to see what people do with just one tangle. What a group of very talented people! Thanks for yet another great challenge, Roy! I appreciate the work that you put into this. My first effort with Monotangles. Thank you for the challenge - I love that it focusses us on one tangle. Ooh, it did take a while before I got Phicops right. I even made of my previous attempts a new tangle: Phicones :-) !! Thanks for this new challenge, glad I insisted to try and try. Now I cán draw Phicops. Pass on to him that it is a great Tangle, this adventure has made me fall in love with it!